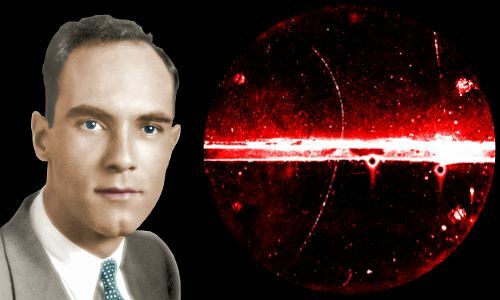 Carl Anderson discovered the positron in 1932, proving the existence of antimatter. He discovered the muon in 1936. Anderson was awarded the 1936 Nobel Prize in Physics for his discovery of the positron. Took photographs of tracks made by cosmic rays as they passed through a cloud chamber he had designed himself. Saw the track of a particle whose behavior was like no particle he had seen before. Correctly interpreted the track, stating it was made by a particle with the mass of an electron, but carrying the opposite charge. Realized he had observed antimatter – the antielectron predicted by Paul Dirac in 1931. Agreed to call the new particle the positron. Discovered the muon while studying cosmic rays. Identified the muon as a subatomic particle whose charge is identical to the electron. Found that the muon’s mass is higher than the electron and smaller than the proton. Carl David Anderson was born on September 3, 1905 in New York City, USA. His parents arrived in New York from Sweden in their late teens. His father, also named Carl David Anderson, was a restaurant manager. His mother, Emma Adolfina Ajaxson, was a housewife. Carl was their only child. In 1912, when Carl was six, his family moved from New York to Los Angeles. His parents were not interested in science, but from about age seven, Carl became increasingly interested in technology, building primitive radio sets. Carl Anderson hoped to become an electrical engineer. He attended L. A. Polytechnic High School, a public school that concentrated on technical subjects. He graduated from high school in 1923, age 17. Next came Caltech (California Institute of Technology) in Pasadena where he intended majoring in Electrical Engineering. While at Caltech he lived at home because his father and mother had separated, and Anderson could not afford to live away from home. In his sophomore year, he learned about modern physics and was astonished by how much he loved it compared with the more basic physics he learned at school. He changed to Physics as a major. In 1927, age 21, he received a Bachelor’s degree in both Engineering and Physics. Anderson continued at Caltech as a graduate student, receiving a PhD in 1930, age 24, for a cloud-chamber study of electrons scattered by X-rays. His doctoral thesis was entitled: Space-Distribution of X-Ray Photoelectrons Ejected from the K and L Atomic Energy-Levels. He spent the rest of his working life at Caltech. Anderson began working with Robert Millikan, famous for determining the amount of charge on the electron. Millikan was studying cosmic rays – high energy particles reaching the earth from the sun and the stars. Cosmic rays produce interesting debris when they crash into our planet’s atmosphere. The debris contains subatomic particles, which are generally unstable and decay quickly into other particles. To study cosmic rays, Anderson designed and built his own cloud chamber – a particle detector containing a supersaturated vapor. When a particle passes through the vapor, it knocks electrons off vapor molecules leaving ions behind. Vapor condenses on these ions, resulting in a trail that can be photographed. Anderson placed an electromagnet around his cloud chamber, which caused charged particles to follow curved trails. By studying a trail, he could deduce the properties of the particle that made it. In 1931, Paul Dirac predicted the existence of antimatter. In 1932, Carl Anderson proved the existence of antimatter experimentally. Anderson’s famous cloud chamber photo – a positron’s trail. The trail shows curvature in the opposite direction from the path expected of an electron. The horizontal structure in the middle of the photo is lead plate, which the particle passes through. In 1936, Anderson was awarded the Nobel Prize in Physics for his discovery of the positron. He shared the prize with Victor F. Hess, who discovered cosmic rays in 1912. In 1936, Anderson and his graduate student, Seth Neddermeyer, discovered the muon using the same equipment as Anderson had used to discover the positron. The muon is a subatomic particle with the same negative charge and spin as the electron, but 207 times more massive. In 1946, age 40, Anderson married Lorraine Bergman. She had been married previously and her son Marshall, who was three, moved into the new family home. Anderson adopted him. Marshall became a mathematician. The couple had a son of their own, David, who became a physicist. In his spare time, Carl Anderson liked to take his sons fishing, hiking, and to football games. Anderson retired from Caltech in 1976, age 70. Carl Anderson died, age 85, on January 11, 1991 at his home in San Marino, California. He was buried in Forest Lawn Memorial Park Cemetery, Hollywood Hills. His wife Lorraine died in 1984. "Carl Anderson." Famous Scientists. famousscientists.org. 27 Mar. 2018. Web.